Irene Lovato is the daughter of noted necklace maker Alice Lovato and sister of necklace maker Lupe Lovato. 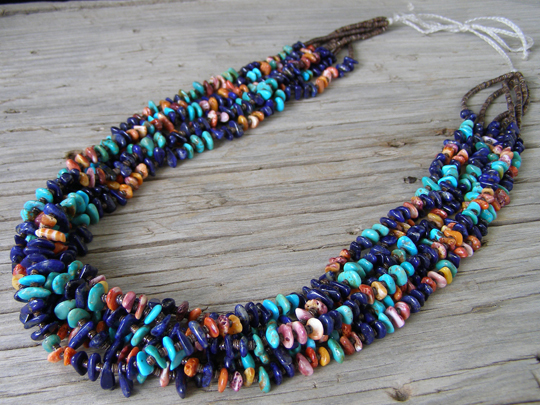 Most of her pieces are multi-strand and their magic is that they are rich with beads and have perfect sway. She almost always braids her beading strings to make a traditional finish which can be tied off at various lengths. This six strand necklace is strung with a rich mix of beads dominated by lapis lazuli, Kingman turquoise, red, orange and purple spiny oyster. Fine-diameter baby olive shell heishi is strung as spacer beads between the lapis lazuli, spiny oyster and Kingman turquoise beads and this lends a suppleness to the strands and aids in their silky, fluid movement. In traditional fashion, the braided beading string is simply tied off in a bow and no metal hardware is used as a catch. Length of the necklace cited below is the measured length at which it is tied in the photographs, but this necklace could be tied at any length from 24" to 32". Usually such a necklace is tied off at a length which allows the wearer to slip it over the head without having to tie it each time to put it on or take it off. Surplus length to the beading string assures that this can be tied to a longer length that will surely fit over any head. Length (as tied in photos): 26"